This tutorial will take you through the steps to set up radio communication with a CR6-Series datalogger. 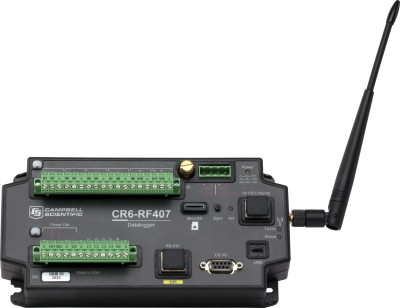 The CR6-RF407 and standalone RF407 are used in the examples. The steps are the same for the RF412 and RF422 models. A CR6-RF407 contains the same radio as a standalone RF407. Most of the radio settings are the same for the CR6-RF407 and the RF407. See the RF407-Series Spread Spectrum Radios manual for more information on specifications and radio communication.